This salad pairs well with blue cheese or smoked gouda. Demoed September 2014. Combine the salad greens and pear slices in a large salad bowl. Put the pecan pieces in small skillet and toast over medium heat until light browned. Shake the skillet often to ensure the nuts are toasting evenly. Remove from heat and transfer right away to a small bowl. Add the butter and ¼ teaspoon of salt and mix well until butter is melted and absorbed by the nuts. In another small mixing bowl, whisk together the vinegar, sugar and ¼ teaspoon of sea salt. Slowly whisk in the oils until well-combined. Toss the salad with just enough dressing to coat. Add the nuts, toss again and serve. Serves 4. 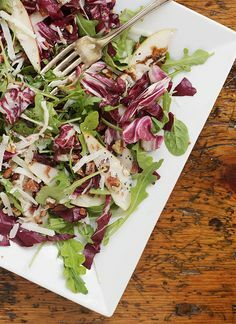 This entry was posted in Salads and tagged arugula, Asian pears, kale, pears, pecan, radicchio, walnut oil. Bookmark the permalink.